Not only did athletes serve as heroes who could “lift us above our humdrum lives,” they also, at least in the case of boxers, served as individual representations of idealized masculine virtue. After the bloody nightmare of war, two men punching each other while wearing padded gloves seemed like a harmless way of enacting courage, valor, and physical and moral strength. While those qualities had proved difficult to celebrate in the context of the unspeakable carnage of real war, they were easily identified or invented in the context of the symbolic wars that took place in the ring. When one of the fighters was a bona fide war hero, there was all the more cause for a near-hysterical fervor concerning the event. Mobilization. The Great Adventure. They’d been mobilized into holes in the ground so constricted they could hardly move. And the Great Adventure—the real life equivalent of all the adventure stories they’d devoured as boys—consisted of crouching in a dugout, waiting to be killed. The war that had promised so much in the way of “manly” activity had actually delivered “feminine” passivity, and on a scale that their mothers and sisters had scarcely known. No wonder they broke down. Hence, perhaps, the thirst for manly spectacles like boxing and hero-worship of its manly practitioners like Dempsey and Carpentier. Boxing was indeed an ideal post-war spectacle, one that provided both a diversion from lingering thoughts of war and a means of processing those thoughts. It was, after all, a spectacle of aggression and of violence without little statistical risk of death or genuinely serious injury and conducted according to all sorts of reasonable rules and precautions. A knockout was a symbolic death and allowed for feelings of either grief or exultation (depending on which fighter one was backing) but the fallen fighter was not really dead and the spectators “mourning” him were not experiencing real grief. This allowed people to revisit some of the emotions experienced during the war, safe in the knowledge that this time little was at stake other than money and relatively minor injuries. Small wonder, then, that the sport proved more compelling to larger numbers of people in the 1920’s than ever before or since. 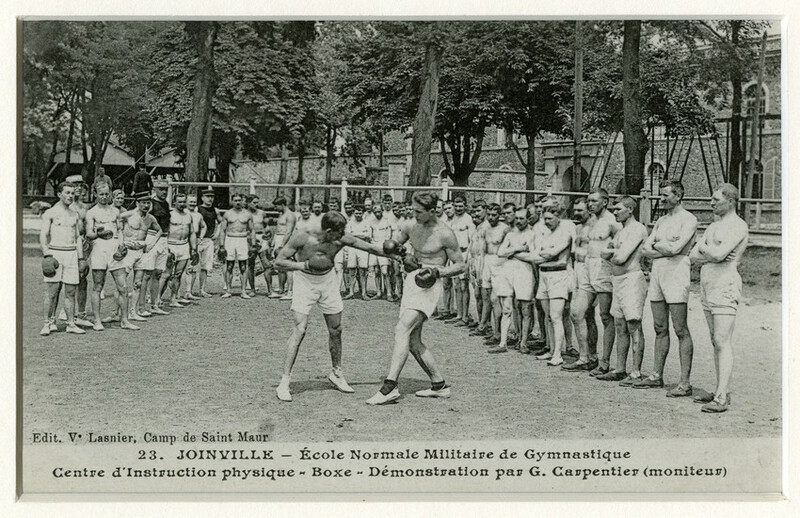 In France specifically, the cultural significance of boxing was much deeper and more complex than it had been before the war. There was more to boxing now than simple nationalistic pride in the knowledge that of a Frenchman had been crowned European champion. There had to be a solemn opening ceremony in the ring to dedicate the match in the minds of the boxing public to the war victims. This was a symbol of national unity and achievement, and a tribute to the war heroes. Focusing upon the idea of national unity helped to reconcile the mood of national mourning with the more ordinary need for entertainment. The nation took this event to its heart. During what proved to be a memorable evening, the boxing ring represented a place of public homage to the example and sacrifice of the dead and injured, of concern and relevance to the whole country. When, after years of warfare, more than one thousand people organized an event that featured aggressive combat, the ceremony itself had to combine a sense of deep public mourning with the festive enjoyment of human violence. After four years of war, after millions of deaths, after countless pictures of and stories about twisted, broken bodies and shattered lives—Europe found a hero who embodied both the romantic expectations of the war and the zest for life and peace. […] No sooner had the war ended than he distinguished himself in the ring. Handsome, urbane, slender and debonair—Carpentier, Europeans believed, would be the perfect man to hold the World Heavyweight boxing title. An essential element of the powerful sway Carpentier held over the European (mostly French and British) imagination in the years just after World War I, however, is the fact that he had already been a hero before the war. It is true that he “distinguished himself in the ring” immediately after the war. The public was not witnessing the emergence of a new face, however, but rather the return of a very familiar one. 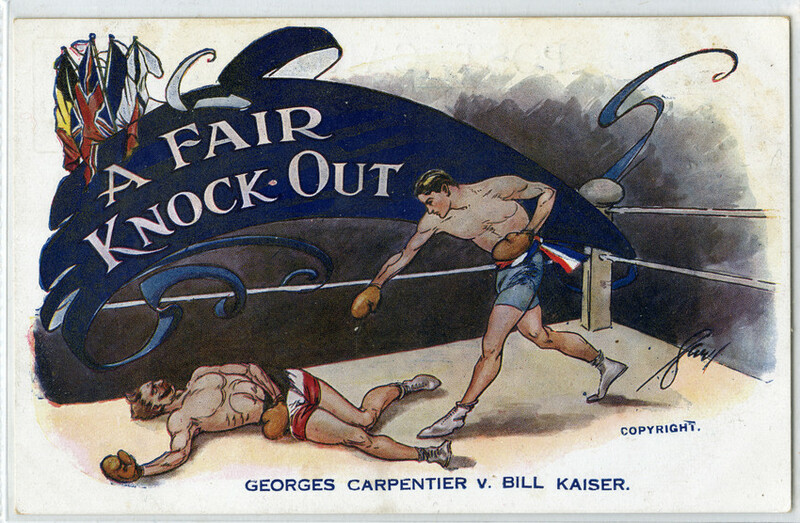 To boxing fans, and to the thousands of he transformed into boxing fans, Carpentier evoked the 1911-1914 period, which, in the wake of the war, had come to look like good times indeed. But it was not just nostalgia for an earlier time that gave Carpentier his aura. It was the fact of his bridging the divide between the pre- and post-war eras that made him so appealing. A sports hero before the war, a military hero during the war and king of the ring again after the war, Carpentier represented above all continuity, the reassuring idea that the world had not changed entirely (since one was, after all, still cheering on the same man) and that not all men had been killed or mutilated in the fighting. Carpentier, as an individual, incarnated crucial proof that war, however devastating, could be survived, that there was not only life, but health and strength and success on the other side. The post-war moment was also propitious for boxing in more historically concrete terms. US soldiers and sailors had been taught how to box as part of their military training; the sparring bouts included in the training were the first boxing matches many of them had ever seen, let alone participated in. In addition to the general toughening-up that putting on the gloves was thought to impart, boxing was considered useful training for bayonet fighting (“Bayonet fighting is boxing with a gun in your hands,” reads a 1918 magazine article entitled “Why Our Soldiers Learn to Box”), since many of the punches in boxer’s arsenal have exact counterparts in bayonet technique. Professional boxers like Mike Gibbons, Benny Leonard, Battling Levinsky and Frank Moran spent their time in the service as boxing instructors. Boxing, it seems, was everywhere in the armed forces: grudges between soldiers or sailors were often settled by having them put on the gloves and box out their differences; “smokers” and both intra- and inter-camp tournaments were common occurrences, extremely well-attended distractions for enlisted men; fights and tournaments were a particularly popular way of passing the time for troops on board ship to and from France, as the surprisingly large number of photographic postcards from the era memorializing these events attests. Indeed, boxing is said to have been the single most popular recreational activity for American soldiers in World War I. The sport appears to have been equally popular among French and British soldiers and sailors. There are numerous English postcards depicting sparring matches and boxing lessons among the troops. [BRITISH POSTCARDS OF SOLDIERS BOXING DURING WAR HERE?] Englishman Robert Graves’ famous memoir of the trenches, Goodbye to All That, mentions boxing while in the army (at one point, in fact, he was sent home to England to have surgery performed on his nose due to a boxing injury incurred while on duty in France). The June 1914 edition of La Boxe et les boxeurs includes a number of letters written by French soldiers, enthusiastically thanking editor Léon Sée for having sent boxing gloves to the active-duty troops. All the letters assure him that the gloves will be put to use; one specifies that they were in fact used the very day of their arrival. All of France was implicated in this championship fight because every Frenchman was fighting alongside Carpentier. And it is true that I myself was propelled by patriotic feeling, the feeling that I was fighting for France. One could add to Carpentier’s thoughts and argue that the Carpentier-Dempsey fight was in some ways the last event of World War I. The fight might be considered the true end-point of the war, providing fans one last chance to experience collectively the emotions associated with war, this time by way of a cathartic, symbolic event, before moving into a new era. Whether one views it as the last communal event of the war era or the first of the post-war era, however, it is clear that it served in either case as a transition point, a mile post demarcating the war from peace. The Carpentier-Dempsey fight, in ways that are numerous, profound and difficult to define with clarity, was indeed “about” World War I. Whether as canny money-making strategies or expressions of a genuine intertwining of the two events in the public psyche, nearly all the discourse before, during and after the fight includes allusions, both implicit and explicit, to the war. One way in which the facts of the matchup stirred up memories of the war, albeit indirectly, was the simple fact of its being a truly international contest. Since the first heavyweight title fight of the gloved era (Corbett-Sullivan, in 1892), the vast majority of title fights in the division had been between two Americans. The notable exceptions are Tommy Burns, an Australian, and Bob Fitzsimmons, an Englishman, both Anglophones, meaning that no fighter from a non-English-speaking country and no fighter from continental Europe had ever fought for the heavyweight crown. So in a very real sense, the Carpentier-Dempsey fight was the first truly global heavyweight title fight (there would be others before too long: Dempsey against Argentinian Luis Firpo, in 1923 and Max Schmeling’s fights in the early 1930’s). Rather than a “world” championship match between two Americans, it was a trans-cultural event, a contest between men from two very different countries. This fact contributed significantly to the interest the fight held for European fans. Americans, despite their fast-growing support for isolationist policies, were also receptive to the international aspect of the event, due to a heightened awareness of the rest of the world, and of France in particular, brought about by the war and the reintegration of the returning doughboys. Regardless of what conclusions they drew with respect to actual foreign policy, Americans were more aware of the fact that they existed in a global context than they had ever been before (it is important to remember that World War I was the first major war in American history to take place on foreign soil) The same can be said of the French: the doughboys were the first Americans many French people had actually seen, their first contact in the flesh with the New World. World War I literally brought home to them the reality of America. Just as France was no longer an abstraction to the doughboys and, by extension, to their friends and families, America and Americans were no longer abstractions to the French. Globalization of the twentieth-century variety was jump-started by the war; the world had become, for better or for worse, a much smaller place. The War had brought unprecedented mutual exchange between the Allies. 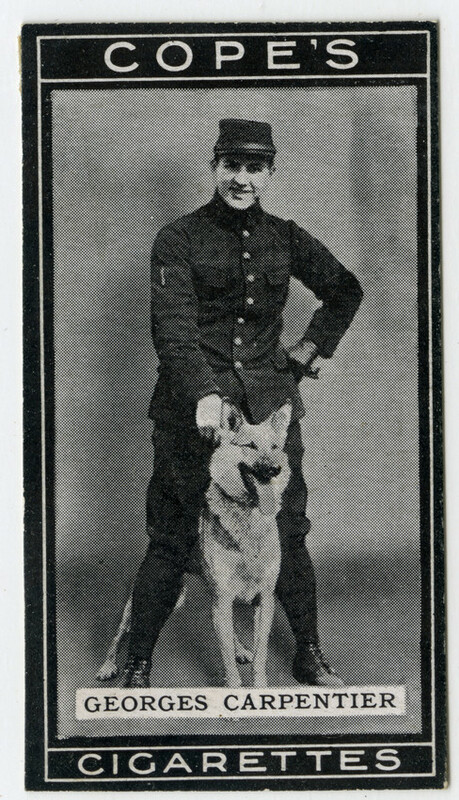 The French, in particular, were suddenly more sensitive to American life and culture and for the first time able to follow what happened across the Atlantic almost as it took place […] The Carpentier-Dempsey fight seemed to sum up the complexity, the mutual attraction and repulsion of the two worlds, drawn together more closely than before both by the First World War and the media revolution that brought not only newsreel pictures but almost instantaneous live communication. In this way, a single fight was overburdened with meaning. The fight, a popular event of equal interest to the two cultures, shared by the two cultures, and experienced simultaneously by the two cultures, brought America and France back together and provided a final concrete sign of the link that the war had forged between the two cultures. Finally there was the Marseillaise. I can still hear it in my head today, I will surely hear it until the day I die, until my last moments of consciousness and lucidity. I was a patriot, I have remained a patriot, as you know. The Marseillaise has always moved me, but the rendition I heard in New Jersey, sung (badly, no doubt) by people who wanted to sing it for me, overwhelmed me to a degree that you cannot imagine. The very thought of it could make me cry right now. The post-fight coverage in both countries relied on the thematics of war to an obsessive degree. It is pointed out in one French paper, for example, that the throngs of people awaiting news of the outcome of the bout on the streets of Paris outnumbered the crowds that turned out at the time of the declaration of war in 1914 and even the Armistice in 1918. In the New York Tribune on July 3, Sophie Treadwell likens Carpentier’s attack on Dempsey to “a single-handed charge à la baionette against a machine gun; no, against heavy artillery,” thereby linking the bout not only to war in general but specifically to the most recent one. Many commentators explicitly described the KO’d Carpentier not as a defeated boxer but as a tragic, noble, fallen soldier. In the New York Herald, July 6, 1921: “Bodies of First Three War Heroes Are Back: Arrive With 1,484 Others on Transport Somme” (“Among the thousands of bodies are those of Corporal James D. Gresham and Privates Thomas E. Enright and Merle D. Hay, all of the Sixteenth Infantry, the first three Americans to go down in the fight in France. They were killed by a German raiding party on the night of November 8, 1917). Perhaps striking than any of this, however, is the fact that the official end of World War I, as signified by President Harding’s signing of a joint Congressional resolution declaring peace with Germany and Austria, took place on July 2, 1921 in Raritan, New Jersey, some forty miles from the Carpentier-Dempsey fight, at 4:10 pm, forty minutes after Carpentier had been counted out in Jersey City. The front page of the New York Times for July 3, 1921, comprises six columns devoted to news of the fight (“Carpentier Broke His Thumb in Fight,” “Blow to the Jaw Ends the Contest,” “Dempsey Proves Prowess,” “Crowd Early At Gates,” etc.) and one to the signing of the declaration of peace (“Harding Ends War; Signs Peace Decree at Senator’s Home”). President Harding showed little interest when informed late today that Jack Dempsey had defeated Georges Carpentier, French challenger, with a knockout in the fourth round. “Was it a good fight?” he asked of newspaper men when told the result. He made no further comment and changed the conversation into other channels. The fact that the President of the United States was preoccupied with things other than the fight—the official end of World War I, for example—seems to suggest a failure on his part to recognize the real story of the day. The New York Herald printed the same wire story, with a different title—“Harding Shows Little Interest in Big Fight: Apparently Not Interested When Told Result”--on the front page of the sports section of their July 3 edition. The front page of the New York Tribune had nearly identical coverage of the two stories as the Times, in terms of both quantity and placement. The war of course had been over for some time and the treaty of Versailles signed two years earlier. Harding’s signing of this belated declaration of peace was by no means insignificant, however, as it was this act that allowed both diplomatic and trade relations between the US and Germany to resume (the news of France’s resuming of trade relations with Germany is reported on the front page of the New York Herald on July 6, contiguous with lingering coverage of the aftermath of Carpentier-Dempsey). So in ways both concrete and symbolic, World War I did indeed end on the afternoon of July 2, 1921, simultaneous, almost to the minute, with the symbolic revisiting of the war that was Carpentier-Dempsey. […] there will probably be 990 more reporters at the battle of Jersey City than there were at the second battle of the Marne, where the fate of civilization or some other purely academic question was settled by a couple of million soldiers. While the accounts of the second battle of the Marne were confined to sketchy and meager official bulletins, there will be a thousand typewriters clicking at the ringside at Jersey City and a thousand telegraph instruments will follow every motion in order that the waiting would not be kept too long in suspense. […] a baffling obsession of mind and emotions that grips, one suspects, far more millions than were touched by the dreadfulness of bloody episodes of the great war. Put it squarely, more people seem to be interested in two young men beating each other with their hammered fists than were stirred by the downfall of Russia. It is frequently remarked that nothing since the sinking of the Titanic has so caught public interest as this prize-fight between a young Frenchman and a young American.